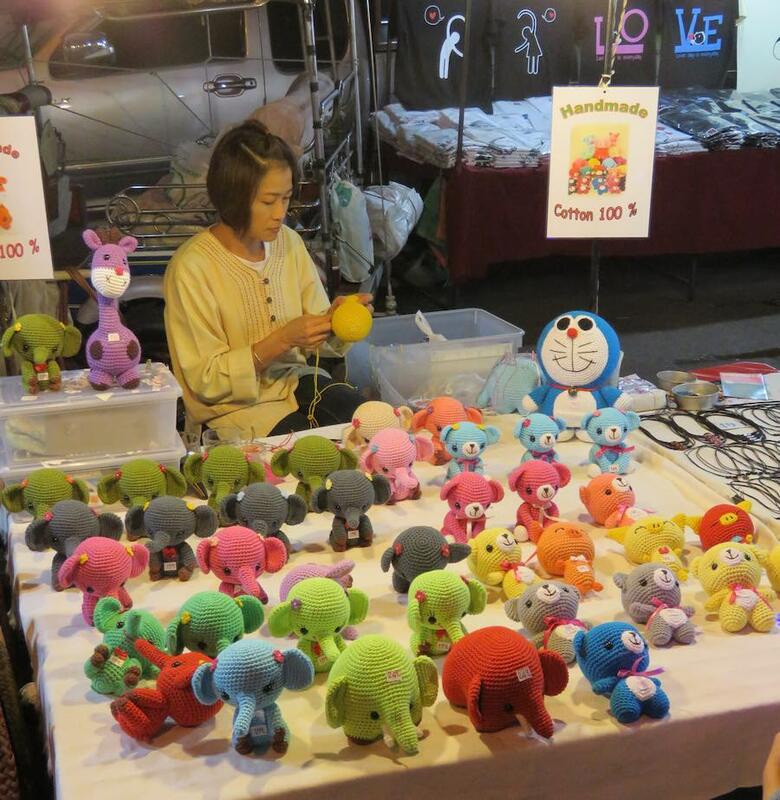 I see the Sunday Market in Chiang Mai, Thailand as a well done attraction created for tourists. 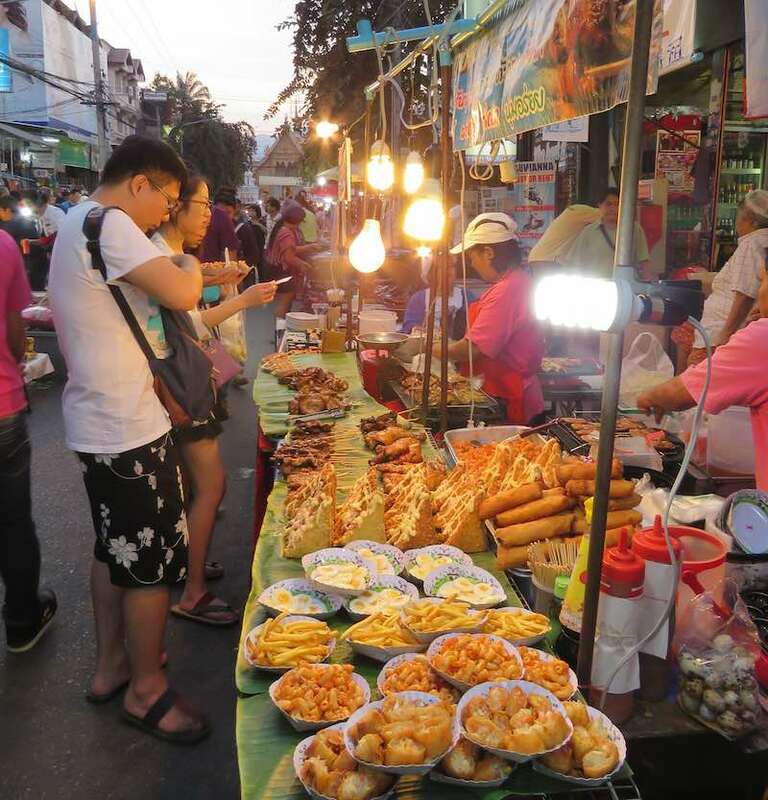 The stalls are selling mainly items of interest to tourists and food. I really like that photo. Here is a similar photo my dad took of an artist drawing my brother (when he was a kid) and we were visiting Rome, Italy. 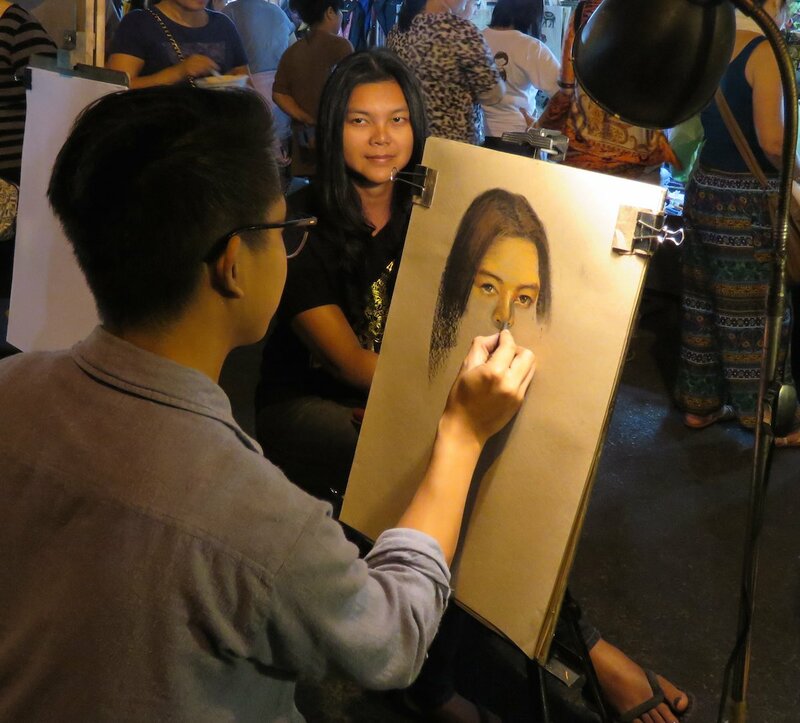 There are a group of about 5 artists drawing portraits in the center of the street. The street was quite packed. Starting just before sunset seems wise (based on my reading) and it worked for me. Others say it gets more crowded later – and it was plenty crowded while I was there. 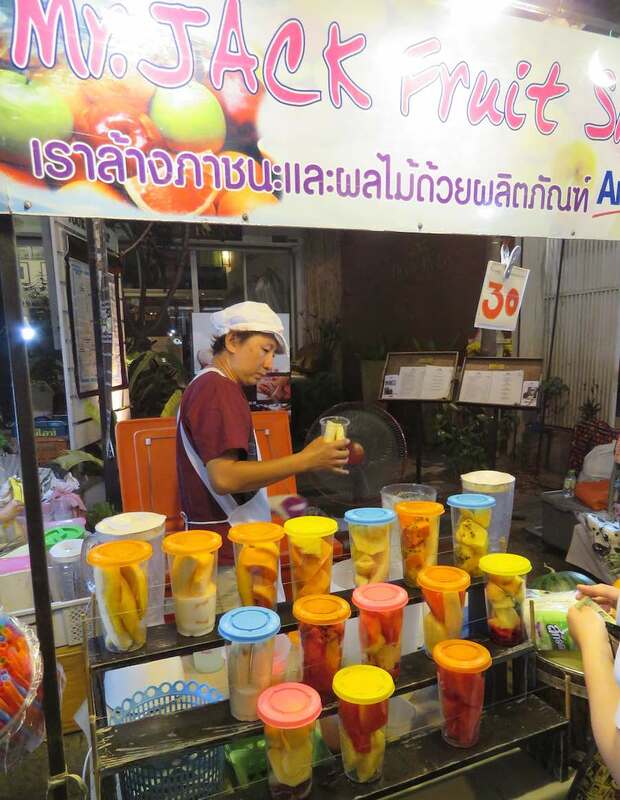 The Sunday market (also called the Walking Street Market) covers from Tha Pae gate to Wat Phra Singh on Ratchadamnoen Road. There are also several singers. I took all the photos included in this post (see more photos from my travels). 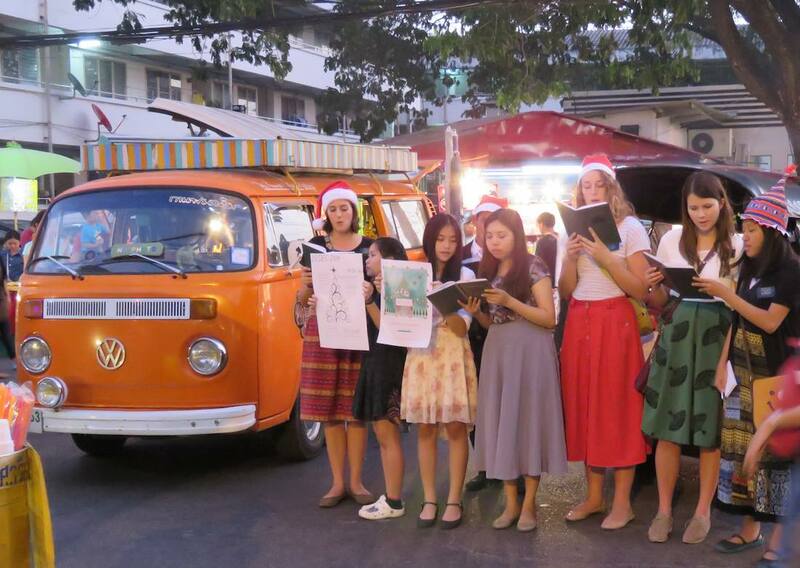 The Christmas carolers were completely drowned out by a long announcement over loudspeakers while I was there. Many of the stalls sell good made by the vendors, which I like since it gives a bit of a local flavor and you have people that are connected to what they are selling. At 6 PM there was a song played over the loudspeakers and everyone stopped (other than a few tourists). I think they are playing the national anthem. I am not clear on exactly how this works (like how often they play it or where). When I was in Bangkok I experienced it once in the train station. I asked someone about it later and they said that this would happen daily, if I understood correctly (and also sometime in the morning, maybe 8AM). But I don’t know where it is broadcast (the train station and market have speaker systems). I haven’t had this happen any other places but I don’t know where it might be played. But when it is all the Thais stop for the 30 seconds or so it takes. It was kind of funny when I was in the train station because I was looking at my iPad Mini map to plan my exit and I get ready to go and everyone is stopped like it is some crowd gimmick on YouTube. Then I noticed the music and it before I could think much more the music stopped and everyone started moving again. 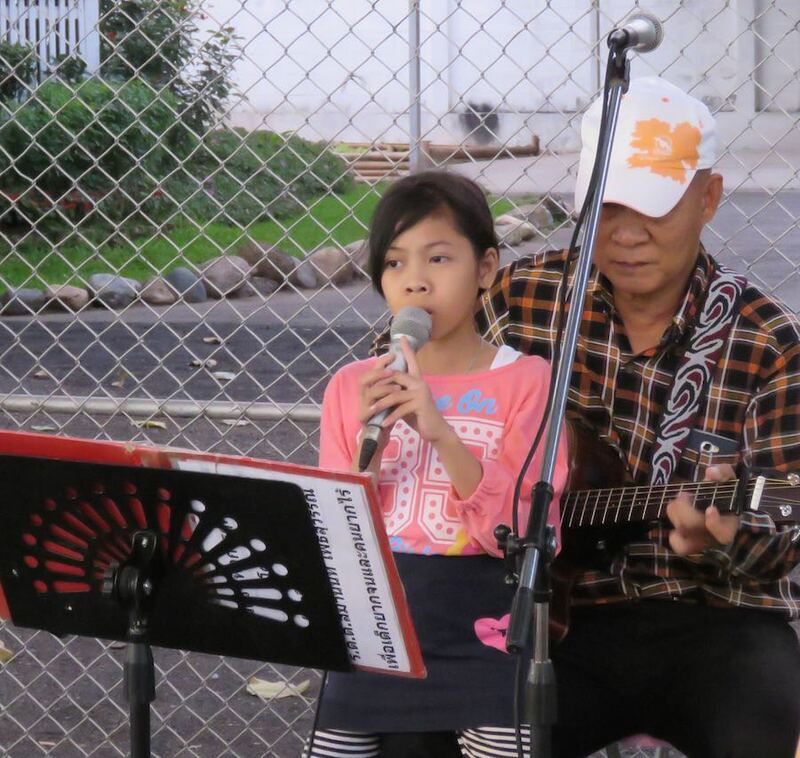 Since I was writing this I figured I would look online, here is more information on the playing of the Thai National Anthem. There was a ton of food. 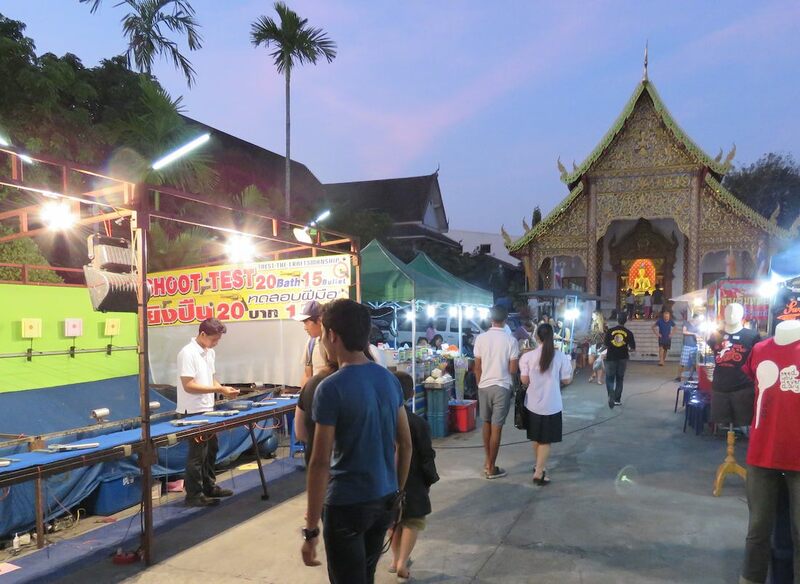 The temple grounds along the road often included food and seating. The Sunday Market isn’t something I would say can’t be missed. But it is well done for this type of thing and worth going in my opinion. I am not a big shopping fan, but this one is worth taking in (even if you only buy food), and there is some nice stuff if you are looking to buy. The shooting gallery (pellet guns I think) was setup inside one of the temples. There were not many similar activity like stall (I don’t remember any others). The song that you heard on the street was the national anthem. It is played once a day at schools and twice a day on radio and TVs. The times are at 8am in the morning and 6pm in the afternoon. If a public place has speakers displayed and it is played loudly through them you have to stop and wait for the anthem to finish. When you are at home I don’t think you have to stand up and do the same, but I might be wrong. I have this every day at school in the morning. 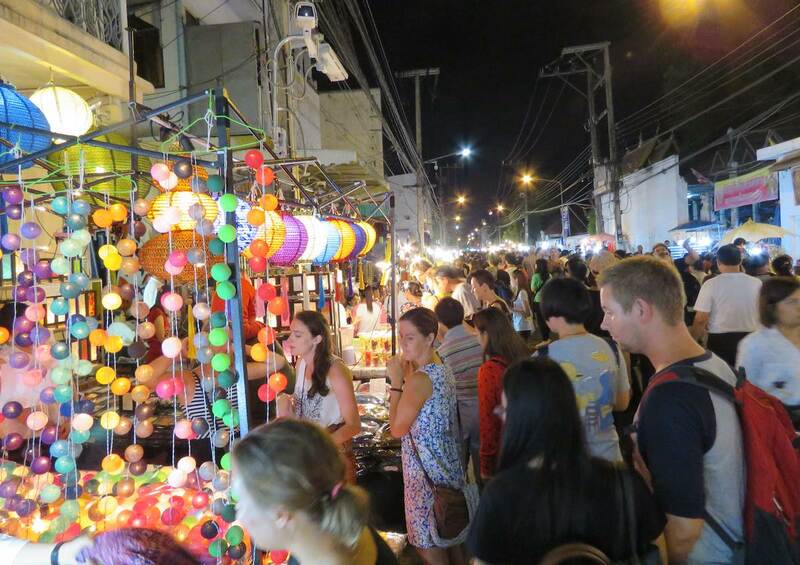 Sunday Market is one of my least favourite places in Chiang Mai. There are too many tourists and it is really packed. I appriciate the fact that you can buy all sort of nice stuff there, and sometimes I go there shopping, but normally I avoid this place.